Ten years after knighthood training was opened to both males and females, no girl has been brave enough to try. 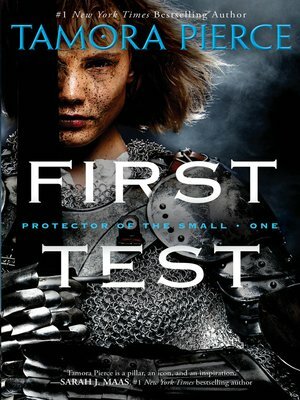 But knighthood is Keladry’s one true desire, and so she steps forward to put herself to the test. Up against the traditional hazing of pages and a grueling schedule, Kel faces one roadblock that seems insurmountable: Lord Wyldon, the training master of pages and squires. He is absolutely against girls becoming knights. So while he is forced to train her, Wyldon puts her on a probationary trial period that no male page has ever had to endure. Further set apart from her fellow trainees, Kel’s path to knighthood is now that much harder. But she is determined to try, and she’s making friends in the most unlikely places. One thing is for sure, Kel is not a girl to underestimate. This entry was posted in eBook Friday and tagged historical fiction, young adult fiction, young adult literature. Bookmark the permalink.